I used it for restore. Because there are many link number settings, you can save time and effort of cutting. I also use it for other bikes. This review is about item#35109986. Small displacement vehicles with no power Onions are less resistant to nonsales than seal chains. You can remove it and wash it. This review is about item#40474147. Although the seal chain is durable, it was bad that the resistance was large and that it could not remove the thorough maintenance. At 250 cc or less, it is light and has less resistance and changed to this type. It is my favorite which is using many more. Cheap, light, less resistance. It's a click type, so it's a merit that you can do thorough maintenance such as removing it and washing it in oil. Durability is supplemented with a legume maintenance. I think that this price is cheap enough if made in Japan. I have not installed it yet, but I think that it is the first product from my experience. During motorcycle maintenance, the chain stretched and it was extended, so I exchanged it. It is very good because it is easy to install with a clip type and the friction loss is also reduced. Although genuine was a seal chain, the resistance is extremely small despite the new item. Even if you remove it and grease it, it is still hard. I dislike the size of this resistance and exchanged it with a non-seal chain. The chain itself is light and the resistance is very low. It is difficult to reduce the speed during idle running, so it can be seen that the running resistance has decreased. Since the problem is narrower than the seal chain, it is how much durability it is. Also not limited to Eganuma, the stickiness of the grease that is painted at the time of shipment of new products is too high, so it is difficult to wipe off the wheel if it gets dirty. I want you to use grease with less scattering and a lower degree of stickiness. If it is a grease now, although it is highly sticky, it scatters and smudges the wheel. I used it for a 125 cc motorcycle. Domestic products of security are this price. Performance is also sufficient. I am satisfied. This review is about item#40474104. We used 25,000 kilos, but there is still no problem. However, because the price is also cheap, it is purchased for early exchange. Because it is easy for damage to the drive and the driven gear when using a chain that extends too much. Lubrication only gives oil at 300 kilometers to 1000 kilometers. 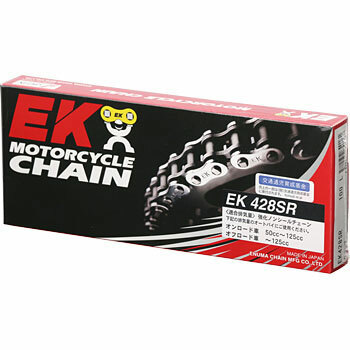 When buying it is decided as Eganuma chain. Because the chain stretched it for replacement. Very little friction during running and became quiet.